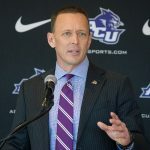 College football’s winningest active head football coach today accepted a new job as Wildcat leader, saying he’s ready for a fresh challenge in his career and feeling like he’s being called to Abilene Christian University for a higher purpose in his life. 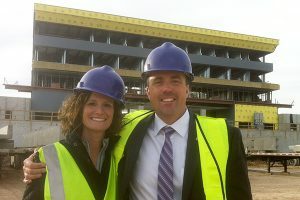 Adam Dorrel and his wife, Erin, toured ACU’s Wildcat Stadium today as construction crews prepare it for opening in Fall 2017. 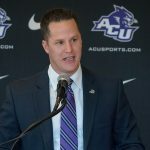 Adam Dorrel, whose Northwest Missouri State University team two days ago won its third NCAA Division II national championship in four years, is ACU’s 20th head coach since the Wildcats began playing intercollegiate football in 1919. 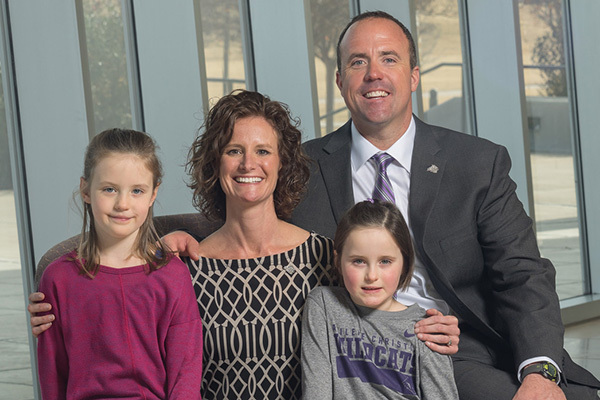 He will have new ground on which to lead his new team in Fall 2017, when Wildcat Stadium opens as the first on-campus football venue on the Hill in more than 50 years. ACU hosts Houston Baptist University on Sept. 16, 2017, in the stadium’s inaugural game. The Wildcats will be full NCAA Division I members this fall after a four-year transition from Division II. 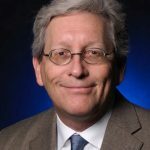 Dorrel carved a 76-8 record in six seasons as the Bearkats’ head coach, winning national titles in 2013, 2015 and 2016 – only the third Division II coach to win three championships. His winning percentage of 90.1 is the tops in the nation, besting Ohio State University’s Urban Meyer (85.5 percent). His former team’s 30-game winning streak is the nation’s best, five more than the University of Alabama’s 25 straight victories. A native of Maryville, Mo. – Northwest’s hometown – Dorrel was named American Football Coaches’ Association Division II Coach of the Year in 2013 and 2015, and is favored to win the award again in 2016. Follow more coverage from today’s announcement here.